Here are some of the best and cheapest workout tools that you can affford easily and would fit into any house and wont take much of a space, and also give us a lot of options ot work out all our body parts using these two tools. And oficurse you need to know how to use them so that it is effective. I am writing this article because i have been through the same phase as everyone of you might be going through, no time, too stressed, too much work, getting sick often, low on stamina. All you need is just little time to exercise and the bit of hardwork and dedication. And with that thought i but a pullubar and a resistance tube to workout at home. We all have days when we feel we need to workout, we need to stay fit, but we dont have time, we dont want to spend too much on tread mills and other Gym equipments. And in a metro city we have the issue of Space at home. And if we bring anything we need to convince our parents to accomodate in the room somehow. I also have been through all this and found these two good equipments and some extra points that can fit into any home. And they are not at all costly. This is a Vaccum Based pullup bar which fits onto two sides of the corridor/ passage and it can take weights upto 120kg, I been using it for a while now nad have had no issus of it falling down. You need to make sure it is really fitted tight. You can buy a resistance tube online through ebay, or any of your nearby sports showroom or sports shops. Make sure the tube is not light weight the rubber quality has to be good, so opt for a better quality one. 1) Patience: You need to have lots of patience to shape your body it does not happen overnight. Start with 15mins and then raise the level to 45mins a day Follow for 3-4 Months and you can see the difference. 2) Eat Well: We all know following a diet is a big thing, but make sure you dont skip your meals, eat healthy. 3) Running: If you can take time out to running then it would be an extra bonus to your fitness. 4) Dont do too much: There may be times where you feel yu cna do much more and stretch your body to the extra mile, dont do that until you feel confident of doing it. You might feel it as simple at start, but it will pain the next day. That can break your rhythm. 5) Do Pushups: Pushups are the best form of bodyweight exercise that you cna do at home, it works all part of the body. 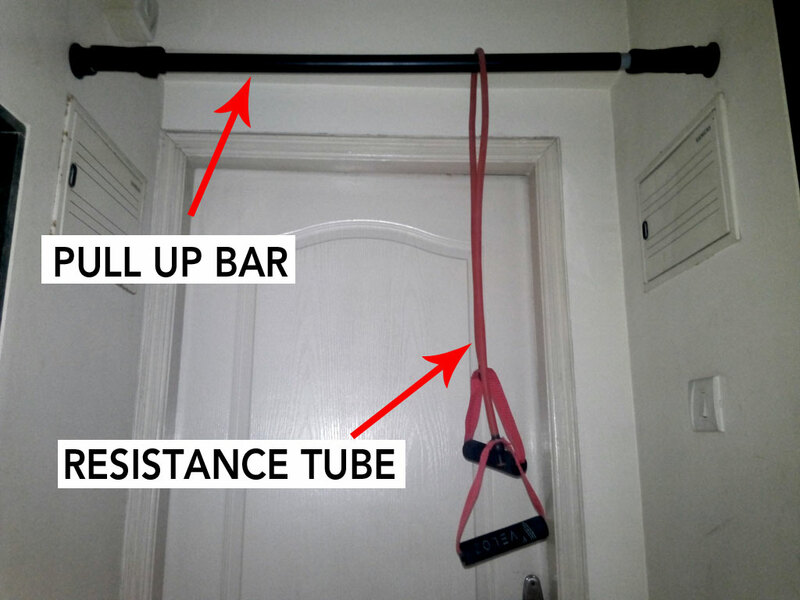 To Know how to use the pullup bar and resistence tube do follow some of the videos take some tips and start working out. (you can find more on youtube) – in the above video you can see how the guy uses the resitence band to do back exercises and tricep pulldown can also be done by putting the reistance tube through the pullup bar.